Martin Tyler (born 14 September 1945) is an English football commentator and coach at Woking Football Club. In 2003, he was voted the FA Premier League Commentator of the Decade. After graduating from the University of East Anglia in the 1960s, Tyler helped in the publishing of Marshall Cavendish's Book of Football. He was also ghostwriter on football pundit Jimmy Hill's column in The Times and reported matches under his own name for that paper. At the urging of Hill he took a job behind the scenes on LWT's The Big Match – which had been established in 1968. His job was solely a production role, but at one match he did his own commentary on a tape recorder and handed it in to his bosses expecting, and indeed initially gaining, little response. However, the break did eventually come with another ITV region Southern Television. Their regular football commentator (and ITV's tennis man) Gerry Williams was indisposed and on 28 December 1974 Tyler made his commentary debut at The Dell describing a Second Division clash between Southampton and Sheffield Wednesday. It was a successful bow and six weeks later he was asked back, soon becoming a regular commentator. In 1976, Tyler moved to Yorkshire Television and began to make an impression on ITV Sport bosses, who included him in the team for the 1978 World Cup. Another change of region came in 1981 as Tyler moved to Granada in his native North West. In 1982, he led ITV's World Cup team, covering every England game and the final alongside Ian St. John. The tournament was also memorable on a personal level because he met his future wife while on duty in Spain. Throughout the 1980s, Tyler established himself as the ITV network's number two commentator behind Brian Moore. He led the team at the 1984 European Championships and also described all the main matches at the 1986 World Cup – except the final, for which Moore flew out from London (the first time he had ever commentated on a World Cup match for ITV, having previously worked from London as anchorman). From 1983 ITV began to show live Football League matches, with Tyler involved in several such broadcasts over the next seven years. It was the frustration of playing second fiddle that saw Tyler search for pastures new and, despite his own reluctance, he signed a deal with British Satellite Broadcasting's Sports Channel in 1990 at the urging of his agent John Hockey. There he covered live FA Cup games, England internationals and the Scottish League. Tyler's voice was still heard on ITV for another two years as they carried the commentaries he provided for the Football League's overseas broadcasts. British Satellite Broadcasting's merger with Sky meant the Sports Channel became Sky Sports in 1991. Since then he has led the Sky commentary team, spearheading the network's coverage of the FA Premier League since its inception in 1992. In April 2003, in the Premier League 10 Seasons Awards, Tyler was voted as the Premier League Commentator of The Decade by fans and a specially assembled panel of football experts. After learning of the honour Tyler stated, "I'd like to thank everybody who voted for me and express my gratitude to all my colleagues at Sky Sports. This award is as much for them as myself and reflects our approach to football. My job has also been made easier by the thousands of individuals within the game who've answered my daily requests for information with the attention and care that make this job so enjoyable." In 2005, Sky began a rotation policy with their leading commentators. Top matches were shared more equally between Tyler, Alan Parry, Rob Hawthorne and Ian Darke – who had returned to football on a regular basis after ten years prioritising boxing. Hawthorne covered the 2005 UEFA Champions League Final for the network. Doubts about the security of his position as Sky's number one commentator alerted rival broadcasting corporations. In January 2007 he was approached by Setanta to be their lead commentator for live Premiership football in 2007–08 but rejected the move and has signed a new contract with Sky Sports. When he is not working for Sky, Tyler can be heard commentating for Premier League Productions, the Premier League's production arm which is responsible for producing, packaging and broadcasting the matches for the Premier League's international broadcast partners. Generally Tyler covers the Monday night matches for the international audience. Since 1990, Tyler has been the main voice for broadcasts on the Australian television network SBS for World Cup, Euro and European club competition matches as well as a number of Australian international matches. With the exception of 2010, when he worked for ESPN in the United States, he has now covered six World Cup Finals for SBS. Fox used Tyler's Sky commentary to cover the 2010 UEFA Champions League Final. This is the first time the Champions League final was broadcast on a major American television network. In addition, he led ESPN's coverage of the 2010 FIFA World Cup and was set to return for the 2014 tournament. However, on 8 January 2014, ESPN and Tyler announced they had mutually agreed to part ways ahead of the 2014 World Cup so that he can focus on Premier League games live on Sky Sports. Having established himself as a leading ITV commentator in the 1980s, Tyler also took on a large amount of freelance work. He has worked for Screensport, commentating on the Freight Rover Trophy Area in 1985 and the Screensport Super Cup in 1986, as well as several South American qualifying matches for the 1990 World Cup. Between 1986 and 1990, Tyler was a regular voice on Octagon CSI's international feed of Serie A along with Peter Brackley. In May 1988, he was the commentator on Sky Television's first football match coverage - a friendly between Manchester United and AC Milan at Old Trafford (the channel had previously broadcast externally produced highlights packages). With his Sky Sports colleague Alan Smith, Tyler commentated on UEFA Euro 2016 for the world feed production, managed by UEFA and IMG. Tyler writes an article on the Sky Sports websites where readers can ask questions about Football usually based on statistics and form of teams. At the end of each article is a 'Tyler's Teaser' in which Martin asks the readers a question of his own. More recently, Martin has recorded his asking of these questions live from the stadium where he commentated the weekend before. 'Tyler's Teaser' originally was for the readers to try to catch Martin out, in asking footballing questions of their own. Although mostly associated with football, Tyler has commentated on other sports. He contributed to Granada TV's coverage of Roses Cricket throughout his time there and even described live netball for ITV's World Of Sport. In the mid-1980s, Tyler also anchored Channel 4's coverage of baseball's World Series. Tyler has been the default commentator for the FIFA video game series since 2006, alongside Andy Gray between 2006 and 2010 and Alan Smith from 2011-present. Tyler also appeared in the movie Goal as a commentator. Tyler has worked as a coach for a number of teams managed by Alan Dowson. In 2005, he joined Walton & Hersham, and has since worked with Dowson at Kingstonian and Hampton & Richmond Borough. In May 2018, he followed Dowson to National League South club Woking, a team he has supported since he was young. Tyler chose Arsenal's unbeaten season in the Premier League in 2003–04 as the greatest moment of the decade, and has expressed the view that sports fans will not see another team unbeaten for a whole season in their lifetimes. He has participated in charity games, where he is proud to claim that he once scored a goal from an Andy Gray cross. In 2004, Tyler was the announcer and event commentator for the ITV sports gameshow Simply the Best. 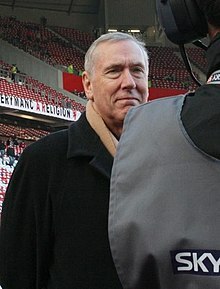 Martin Tyler is well known for his dramatic commentary on the last game of the 2011–12 Premier League season. Tyler's comments when Sergio Agüero netted a late winner against Queens Park Rangers for Manchester City to win their first Premier League title is one of his most famous pieces of commentary. Tyler later revealed he was "glad he didn't mess up" one of his most iconic moments. ^ "COMMENTATOR OF THE DECADE – Martin Tyler". Premier League. Archived from the original on 2 January 2007. Retrieved 9 October 2009. ^ "Martin Tyler". Talk Football. Retrieved 22 June 2008. ^ Kelso, Paul (31 January 2007). "Glazers' United give loyal Gill £200,000 rise". The Guardian. London. Retrieved 12 May 2010. ^ "Champions League final to air on FOX". Fox Sports. 17 May 2010. ^ "Tyler tabbed by ESPN for 2010 World Cup announcing position". Sports Illustrated. 18 October 2009. Retrieved 20 October 2009. ^ "ESPN keeping Martin Tyler for the 2014 World Cup". Associated Press. ^ "ESPN and Martin Tyler Mutually Agree to End Relationship Ahead of the 2014 FIFA World Cup". ESPN. 8 January 2014. Retrieved 8 January 2014. ^ a b "Martin Tyler". British Film Institute. Retrieved 1 July 2018. ^ Martin Tyler knows baseball, too. Newsday.com. 12 June 2010. Retrieved 10 May 2012. ^ Youlton, Clive (16 May 2018). "Sky Sports ace Martin Tyler relishing Woking coaching role under new boss Dowson". SurreyLive. Retrieved 1 July 2018. ^ "Tyler's Top 10". Sky Sports. 26 December 2009. ^ "Martin Tyler on his iconic Sergio Aguero commentary: "I'm just glad I didn't mess it up"". Mirror. 10 May 2015. Wikimedia Commons has media related to Martin Tyler. This page was last edited on 7 April 2019, at 22:37 (UTC).